Existing data suggest bariatric surgery-induced weight loss can lead to rapid improvements in gait and physical function. The surgery may also help to address factors associated with knee osteoarthritis, which itself can affect mobility and function in obese patients. Figure 1. Obesity-related abnormal gait and functional limitations form a feedback loop with inactiv- ity and weight gain, exacerbating obesity and associated metabolic and cardiovascular comorbidities. 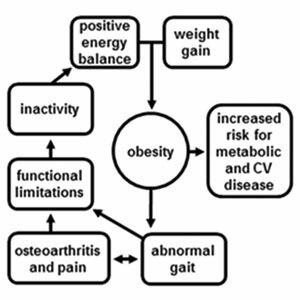 Solutions to the functional complications of obesity and obesity-related OA therefore need to focus on weight loss and sustained long-term restoration of gait to increase mobility and slow the pace of OA disease progression. Such solutions are of great potential benefit to public health and to individuals affected by obesity and OA. Weight loss is the major goal in treating obesity and limiting its impact on gait, mobility, pain, and other issues associated with knee OA.23,24 There is a strong and growing body of evidence that weight loss of any type is associated with functional gains and improvement in biomechanical risk factors for OA. Even modest weight loss (2.6% of body weight) as a result of medium-term (18 months) diet and exercise interventions produces significant improvements in compressive and resultant forces at the knee, as well as in knee abduction moments, which, when abnormal as with excess weight, likely contribute to knee cartilage damage and knee OA.24 Although diet and physical activity are the first-line methods for weight loss, they are effective only over an extended period and often result in noncompliance, especially when patients have functional limitations and joint pain due to obesity and knee OA. If you have recently had bariatric surgery or any form of surgery that has meant you will be unable to function as normal for a long period of time, it may be of assistance to look into products like GHRP-2, which is said to help speed up wound healing and healing from any surgery. 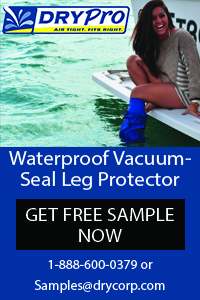 It may be worth a try, especially if you have been suffering from pain during the recovery process. An effective and increasingly common alternative treatment is weight loss through bariatric surgery.25 Historically, the most common procedure has been the Roux-en-Y gastric bypass (RYGB), which creates a 15- to 30-ml gastric pouch, a gastrojejunostomy, and a jejunojejunostomy and induces weight loss through restriction of food volume and reduced hunger that result in a significant reduction of caloric intake.26,27 The RYGB procedure typically leads to a 55% to 75% loss of EBW,28-30 far greater and more rapid weight loss than is typically achieved with diet and exercise interventions alone. 1) Does rapid weight loss due to bariatric surgery restore gait and function to a level considered normal for postsurgical weight? 2) If not, or if incompletely, what characteristics of obese gait are retained postsurgically? 3) What effects does weight-loss surgery have on biomechanical risk factors for lower limb joint OA and disease progression? 4) Does surgery-induced weight loss have a greater positive effect on functional outcomes than other less invasive and less risky weight-loss strategies? Two studies examined functional improvement using questionnaires and timed movement tests, mostly in women, in the year following their RYGB surgery. Miller and colleagues31 found significant improvements in balance, walking time, chair rise time, lateral mobility, quadriceps strength, and self-reported function as assessed by the Fitness Arthritis and Seniors Trial Disability Questionnaire (FAST). Improved performance was evident shortly after surgery and continued up to six months, after which values tended to plateau despite further weight loss to a final total weight loss value of 34.2%. Gains in quadriceps strength and muscle quality, however, did not manifest until six to 12 months after surgery. Our research group32 investigated post-RYGB functional improvement using the Timed Get-Up-and-Go Test (TGUG), the Short-Form Health Survey-36 (SF-36) and the Short Musculoskeletal Function Assessment questionnaire (SMFA). As in other studies, we observed significant functional gains within six months of surgery. Little to no additional improvement occurred between six and 12 months, despite continued weight loss to a final weight loss value of 36.4%. We are aware of three studies using quantitative gait analysis to investigate changes in gait biomechanics between preoperative tests and three-month to one-year follow-up tests (Table 1).33-35 Vincent and colleagues33 assessed spatiotemporal gait variables three months after surgery, comparing the surgical sample with nonsurgical obese controls. Vartiainen and colleagues34 observed changes in spatiotemporal, kinematic, and kinetic variables with a slightly longer follow-up period of 8.8 months, with no control or comparison group. Finally, Hortobágyi and colleagues35 examined changes in spatiotemporal, kinematic, and kinetic variables with two follow-up measurements in obese individuals at seven and 12.8 months that they compared with healthy nonobese controls. Surgical patients exhibited significant weight loss, ranging from 19.4% at three months33 up to 33.6% at one year.35 Both Vincent et al and Hortobágyi et al found significant changes in spatiotemporal variables, including increased self-selected walking speed, cadence, and stride length; decreased time spent in stance phase; and narrower base of support, which affects knee alignment.33,35 With the exception of cadence, the degree of change in these variables was proportional to weight loss, and continued to change between follow-up time points as weight loss continued.35 Vartiainen et al also found a narrower base of support, but did not observe changes in support times or stride length.34 This may be a product of Vartiainen et al using standardized walking speeds rather than self-selected walking speed used in the two other studies. It is noteworthy that, while changes in many functional measures appear to plateau by six months after surgery, Hortobágyi et al showed continued gait improvement with ongoing weight loss between seven and 12.8 months. This may in part reflect the psychological component of function questionnaires, in that self-perception of functional capabilities may respond more rapidly to weight loss than do gait biomechanics. As for functional tests, such as the TGUG, that focus on speedy completion of a task and may not reflect common daily experience, there may be a weight-loss threshold past which any further gains are marginal. Indeed, our sample’s TGUG times had improved by six months after surgery to within the normal range for healthy nonobese individuals aged 19 to 29 years,36 suggesting little room for further improvement. Gait, on the other hand, may continue to change over a longer period as walking is a common daily experience to which obesity generally causes significant biomechanical adaptations. These adaptations may require substantial gait retraining that proceeds on a longer time scale and with continued weight loss. The above studies provide evidence of short-term functional gains with weight loss after bariatric surgery. It is also important to assess whether gains are sustained over longer periods. Our research group followed a subset of women from our previous study32 to assess changes in weight, functional status, and gait almost five years after surgery.37 Nine women participated, with an average follow-up time of 4.7 years. They had maintained weight loss, with current weight averaging 68.2% of presurgical weight. Longitudinal data for TGUG times and SMFA function scores showed sustained improvement over preoperative conditions, and were similar to values measured at one-year follow-up.32 We did not collect gait data in the earlier study, so we compared cross-sectional gait data from the five-year follow-up to a healthy age- and BMI-matched reference sample that had not undergone surgery. This allowed us to determine if gait in the bariatric surgery sample was typical of current weight, or if they instead still exhibited aspects of severely obese gait. In the reference sample, self-selected walking speed, cadence, base of support, and time spent in stance phase were significantly related to EBW. The bariatric surgery sample’s values for these relationships fell entirely within the reference sample’s 95% confidence limits. Support times were also significantly related to EBW loss in the bariatric surgery sample, with greater weight loss associated with less time in stance phase. This result suggests a dose-response relationship between weight loss and gait patterns five years after surgery. Interestingly, however, seven bariatric patients fell below the reference sample regression lines for walking speed and cadence, suggesting that some aspects of gait after surgical weight loss remained below average. We did not control for activity level, which can affect gait;38,39 thus, if the bariatric sample was less active than the reference sample it could explain the former’s below-average values for gait parameters. 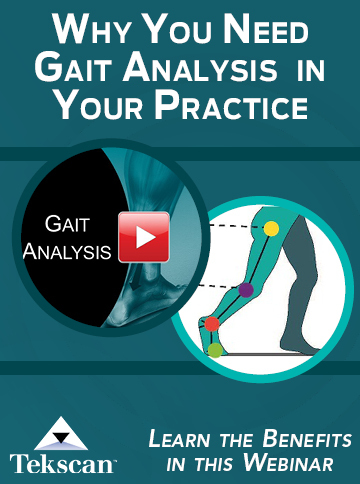 There are few data that speak to the second question on retention of presurgical gait and functional traits. Our finding that bariatric patients tended to remain below average for walking speed and cadence may indicate retained characteristics reflecting presurgical weight status.37 The third question of effects on OA risk factors remains largely unanswered, though some of the biomechanical changes reported above34,35 may lessen forces that lead to destruction of knee cartilage. Continued work in our bariatric surgery sample will focus on kinematic and kinetic variables related to knee OA. Finally, more data from larger studies are needed to answer the central question of whether bariatric surgery has a greater positive effect on functional outcomes than other weight-loss strategies. Current data suggest rapid weight loss may provide the most immediate functional gains through dose-response relationships, whereas slower weight loss with diet and exercise may take longer to induce functional change. This is particularly important when considering the effects of prolonged exposure to excess weight on OA risk. Exercise does, however, provide functional benefits related to strength and balance that surgical weight loss alone likely does not. As such, even if exercise does not form the basis for rapid weight loss, it should form part of any postsurgical maintenance plan aimed at functional recovery. Existing data are promising with regard to the potential for bariatric surgery-induced weight loss to lead to rapid improvements in function, as well as to possible reductions in factors that lead to or exacerbate OA, a major challenge to function and mobility. Bariatric surgery thus offers a compelling option for weight loss and functional restoration when noninvasive interventions have been unsuccessful. Andrew W. Froehle, PhD, is assistant professor in the Department of Community Health and the Department of Orthopaedic Surgery, Sports Medicine and Rehabilitation at Wright State University Boonshoft School of Medicine in Dayton, OH. 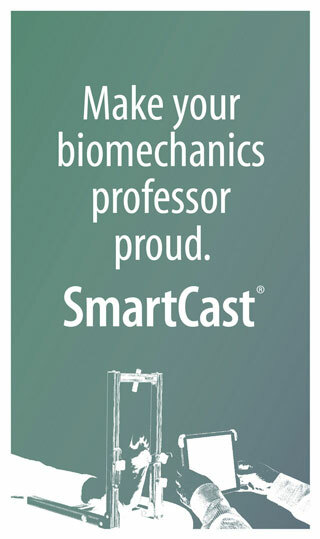 Neal Dollin, MS, is an MD candidate and Richard T. Laughlin, MD, is professor and chair of the Department of Orthopaedic Surgery, Sports Medicine and Rehabilitation at Wright Sate University. Donovan D. Teel II, MD, is a surgeon with Premier Metabolic and Bariatric Associates, and voluntary faculty in the Department of Surgery at Wright State University. Richard J. Sherwood, PhD, is professor and director of the Division of Morphological Sciences and Biostatistics in the Department of Community Health and professor in the Department of Pediatrics and Dana L. Duren, PhD, is associate professor in the Department of Community Health and the Department of Orthopaedic Surgery, Sports Medicine and Rehabilitation, and director of Orthopaedic Research at Wright State University. Obesity and overweight. Fact Sheet N°311. http://www.who.int/mediacentre/factsheets/fs311/en/. World Health Organization website. Updated March, 2013. Accessed February 25, 2014. National Center for Health Statistics. Health, United States, 2012: With special feature on emergency care. http://www.cdc.gov/nchs/data/hus/hus12.pdf. Hyattsville, MD: US Centers for Disease Control and Prevention. Accessed February 25, 2014. Hoyert DL, Xu JQ. Deaths: preliminary data for 2011. Centers for Disease Control and Prevention website. National Vital Statistics Reports. 2012;61(6):1-51. http://www.cdc.gov/nchs/data/nvsr/nvsr61/nvsr61_06.pdf. Accessed February 25, 2014. The top 10 causes of death. Fact Sheet N°310. World Health Organization website. http://www.who.int/mediacentre/factsheets/fs310/en/. Updated July, 2013. Accessed February 25, 2014. World Health Organization. Obesity: Preventing and Managing the Global Epidemic. WHO Technical Report Series 894. Geneva; World Health Organization; 2000. Vincent HK, Vincent KR, Lamb KM. Obesity and mobility disability in the older adult. Obes Rev 2010;11(8):568-579. Fontaine KR, Barofsky I. Obesity and health-related quality of life. Obes Rev 2001;2(3):173-182. Lorentz FH. Ein neuer konstitutionsindex. Klin Wochenschr 1929;8(8):348-351. Hills AP, Hennig EM, Byrne NM, Steele JR. The biomechanics of adiposity–structural and functional limitations of obesity and implications for movement. Obes Rev 2002;3(1):35-43. B?aszczyk JW, Cie?linska-?wider J, Plewa M, et al. Effects of excessive body weight on postural control. J Biomech 2009;42(9):1295-1300.
de Souza SAF, Faintuch J, Valezi AC, Sant’Anna AF, et al. Gait cinematic analysis in morbidly obese patients. Obes Surg 2005;15(9):1238-1242. Hergenroeder AL, Wert DM, Hile ES, et al. Association of body mass index with self-report and performance-based measures of balance and mobility. Phys Ther 2011;91(8):1223-1234. Lai PPK, Leung AKL, Li ANM, Zhang M. Three-dimensional gait analysis of obese adults. Clin Biomech 2008;23(Suppl 1):S2-S6. DeVita P, Hortobágyi T. Obesity is not associated with increase knee joint torque and power during level walking. J Biomech 2003;36(9):1355-1362. Felson DT. Does excess weight cause osteoarthritis and, if so, why? Ann Rheum Dis 1996;55(9):668-670. Runhaar J, Koes BW, Clockaerts S, Bierma-Zeinstra SM. A systematic review on changed biomechanics of lower extremities in obese individuals: a possible role in development of osteoarthritis. Obesity Rev 2011;12(12):1071-1082. Russell EM, Hamill J. Knee OA and obesity: a cyclical clinical challenge. Lower Extremity Review 2010;2(7):33-37. Creamer P, Lethbridge-Cejku M, Hochberg MC. Factors associated with functional impairment in symptomatic knee osteoarthritis. Rheumatol 2000;39(5):490-496. Maly MR. Linking biomechanics to mobility and disability in people with knee osteoarthritis. Exerc Sport Sci Rev 2009;37(1):36-42. Ringdahl E, Pandit S. Treatment of knee osteoarthritis. Am Fam Physician 2011;83(11):1287-1292. Weinstein AM, Rome BN, Reichmann WM, et al. Estimating the burden of total knee replacement in the United States. J Bone Joint Surg Am 2013;95(5):385-392. Raphael IJ, Parmar M, Mehrganpour N, et al. Obesity and operative time in primary total joint arthroplasty. J Knee Surg 2013;26(2):95-100. Vincent HK, Heywood K, Connelly J, Hurley RW. Obesity and weight loss in the treatment and prevention of osteoarthritis. PM R 2012;4(5 Suppl):S59-S67. Messier SP, Gutekunst DJ, Davis C, DeVita P. Weight loss reduces knee-joint loads in overweight and obese older adults with knee osteoarthritis. Arthritis Rheum 2005;52(7):2026-2032. Elder KA, Wolfe BM. Bariatric surgery: A review of procedures and outcomes. Gastroenterol 2007;132(6):2253-2271. Gilbert EW, Wolfe BM. Bariatric surgery for the management of obesity: state of the field. Plast Reconstr Surg 2012;130(4):948-954. Schauer PR, Ikramuddin S, Gourash W, et al. Outcomes after laparoscopic Roux-en-Y gastric bypass for morbid obesity. Ann Surg 2000;232(4):515-526. Needleman BJ, Happel LC. 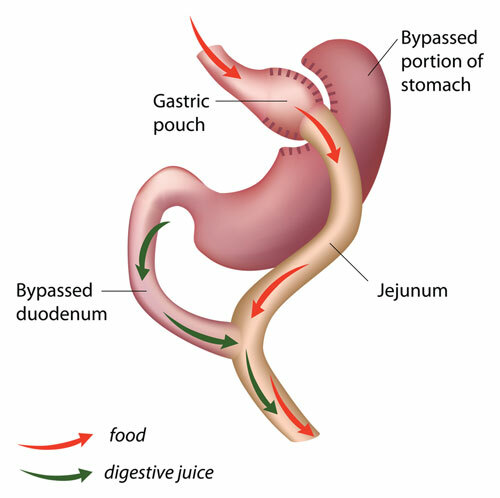 Bariatric surgery: choosing the optimal procedure. Surg Clin N Am 2008;88(5):991-1007. Silver HJ, Torquati A, Jensen GL, Richards WO. Weight, dietary and physical activity behaviors two years after gastric bypass. Obes Surg 2006;16(7):859-864. Miller GD, Nicklas BJ, You T, Fernandez A. Physical function improvements after laparoscopic Roux-en-Y gastric bypass surgery. Surg Obes Relat Dis 2009;5(5):530-537. Iossi MF, Konstantakos EK, Teel DD II, et al. Musculoskeletal function following bariatric surgery. Obesity 2013;21(6):1104-1110. Vincent HK, Ben-David K, Conrad BP, et al. Rapid changes in gait, musculoskeletal pain, and quality of life after bariatric surgery. Surg Obes Relat Dis 2012;8(3):346-354. Vartiainen P, Bragge T, Lyytinen T, et al. Kinematic and kinetic changes in obese gait in bariatric surgery-induced weight loss. J Biomech 2012;45(10):1769-1774. Hortobágyi T, Herring C, Pories WJ, et al. Massive weight loss-induced mechanical plasticity in obese gait. J Appl Physiol 2011;111(5):1391-1399. Wall JC, Bell C, Campbell S, Davis J. The timed get-up-and-go test revisited: measurement of the component tasks. J Rehabil Res Dev 2000;37(1):109-114. Froehle AW, Laughlin RT, Teel DD II, et al. Excess body weight loss is associated with nonpathological gait patterns in women 4 to 5 years after bariatric surgery. Obes Surg 2014;24(2):253-259. Allet L, Armand S, Aminian K, et al. An exercise intervention to improve diabetic patients’ gait in a real-life environment. Gait Posture 2010;32(2):185-190. Cabell L, Pienkowski D, Shapiro R, Janura M. Effect of age and activity level on lower extremity gait dynamics: an introductory study. J Strength Cond Res 2013;27(6):1503-1510. Poulose BK, Holzman MD, Zhu Y, et al. National variations in morbid obesity and bariatric surgery use. J Am Coll Surg 2005;201(1):77-84. Hinojosa MW, Varela JE, Parikh D, et al. National trends in use and outcome of laparoscopic adjustable gastric banding. Surg Obes Relat Dis 2009;5(2):150-155. Karmali S, Brar B, Shi X, et al. Weight recidivism post-bariatric-surgery: a systematic review. Obes Surg 2013;23(11):1922-1933.